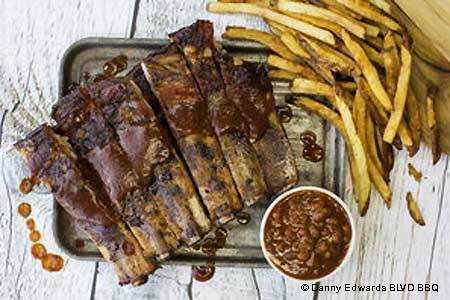 Danny Edwards barbecue is still smokin'-tasty after all these years. : Downtown's revitalization didn't include Danny Edwards' 18-seat, lunch-only barbecue joint with an "eat it and beat it mentality." So, he went looking for a new home on Southwest Boulevard in the city's West Side neighborhood. He took some of the artifacts from the old spot, including the 400-pound pink, concrete pig. You'll find onion rings and french fries on the menu to enjoy alongside brisket sandwiches, burnt ends and ribs. The sauce is ketchup-based and Texas-style and meats are seasoned after they are smoked. Desserts include homemade brownies and bread pudding. Beer and wine are available.